Step #1. Click the  menu on your Mac and then select Restart. Step #2. Next up, you have to hold down command+R to boot into the Recovery System. Step #3. Now, you need to click on the Utilities menu and choose Terminal. Step #4. Up next, you will have to type csrutil disable and press return. Step #5. Close the Terminal app. Step #6. You need to click the  menu and choose Shut Down. Step #6. Switch “Next Display” or “Previous Display” with a keyboard shortcut (CONTROL + OPTION + COMMAND + LEFT or RIGHT ARROW). * Spectacle switches apps between displays in both Windowed and Fullscreen mode. Matching the ghost display’s resolution with the internal display using DisableMonitor is therefore recommended. Nice job! 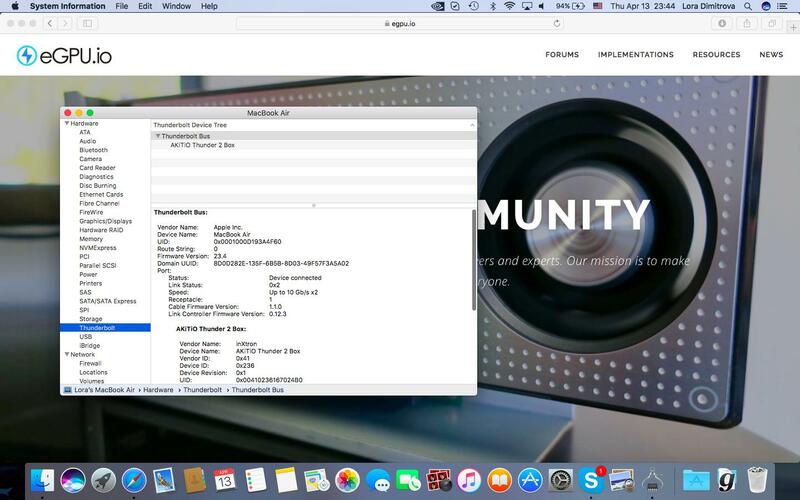 I have a GTX 1080 I am trying to setup -- same method but with a 2012 retina MBP. 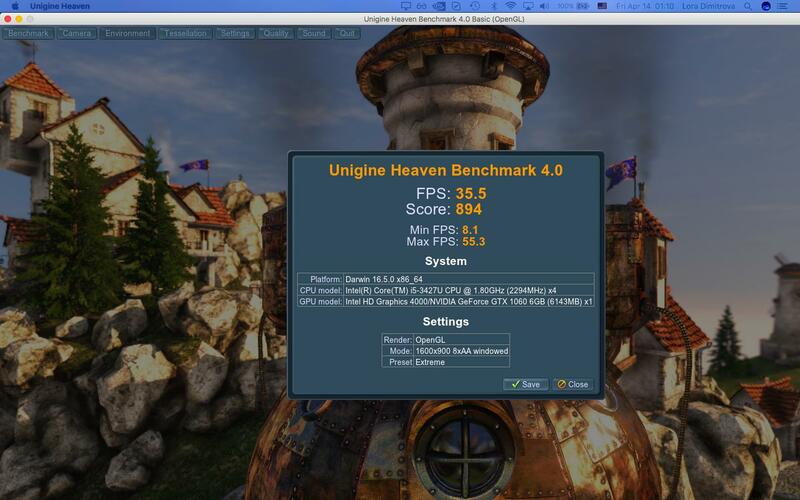 I'm using a sonnet express III-d, and while I'm close, inside my system report under "Graphics/Displays" it reads "Intel HD Graphics 4000", "NVIDIA Chip Model", "NVIDIA GeForce GT 650M" (dGPU). Can't seem to get the readout from Mac OS X to say anything different than "NVIDIA Chip Mode". Interestingly, the VRAM listed for the chip model reads: 256 MB -- which we know a GTX 1080 has roughly 8000 MBs of VRAM. Strange. Let me know if you have any suggestions! I'm desperate! 🙂 Thanks! @zachb What is your macOS version, the new Pascal drivers works only on 10.12.4 ? 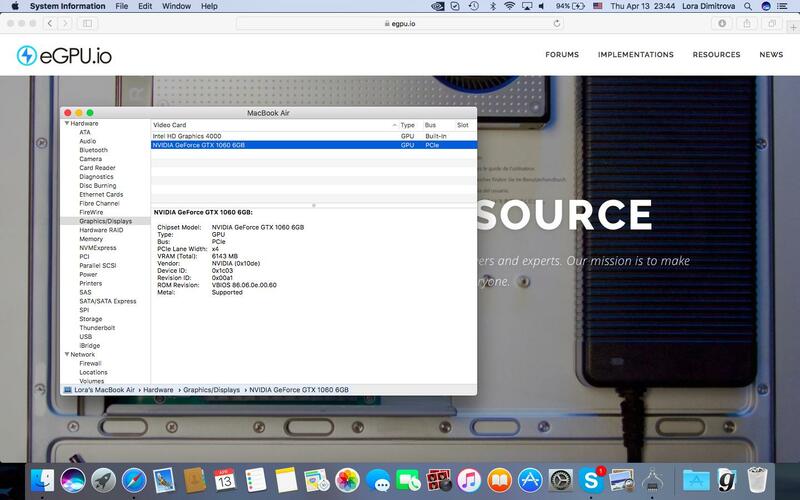 Curious about which version of macOS too - by the looks of the desktop El Capitan or Sierra? I'm having similar problems. I've done the instructions exactly as said. 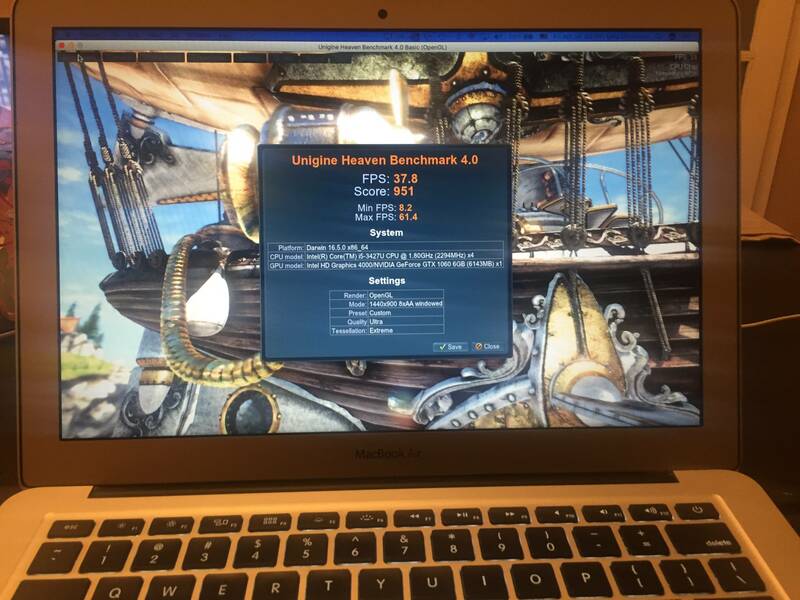 I am running a macbook mid 2011, with akitio Thunder 2, and a zotac Geforce GTX 760 2gb Amp Edition. I've loaded the script, I have everything powered on, gpu is spinning upon startup, in my system report, in the graphics section I'm only getting the original "HD Graphics 3000 288mb" and it's not seeing my new gpu. It is however identifying the akitio thunder2 in the thunderbolt section. I've tried uninstalling and starting again. Now when I attempt to put in the script I get the message "Thunderbolt device is connected, but no external gpus detected"
Should the Zotac Geforce GTX 760 2gb Amp Edition work?